Source: Roman Dyboski, ed., Songs, Carols, and Other Miscellaneous Poems. From the Balliol MS. 354, Richard Hill's Commonplace-Book. (London: Published for the Early English Text Society by Kegan Paul, Trench, Trübner & Co., Limited, 1907) (issued in 1908), pp. 103-104. Early English Text Society, Extra Series, No. CI. The manuscript is held in the Balliol College Library, Oxford. 87. How ! we shall have game & sport ynow ! I met with a foster ; he bad me a-bid. With " hay go bet, hay go bett, hay go bett,"
How ! we shall haue game & sport ynow. 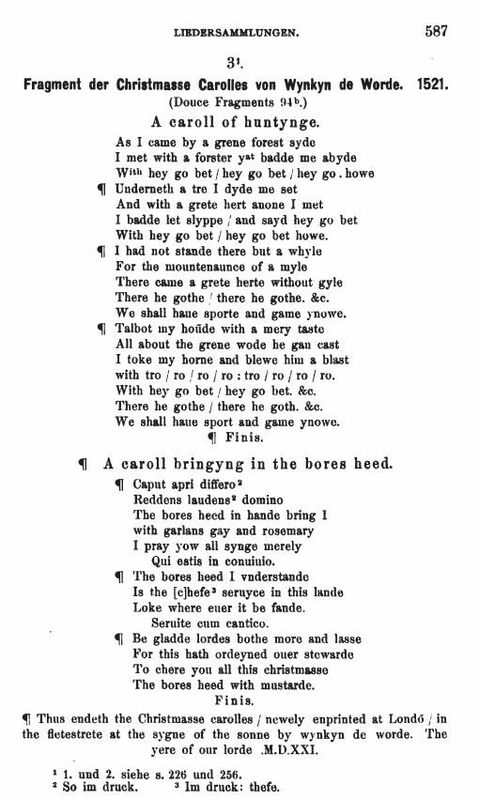 With " þer he goth, þer he goth, þer he gothe " ! With " trororo, trororo, trororo,"
montenance (for montance, "appar. simulating the form of maintenance"), amount, space, extent (used of time). In Dyboski's Notes, p. 186, he also prints Wynkyn de Worde's text of 1521 as reprinted from the Douce Fragment 94b, Bodlein, in Anglia Vol. 12 (1889), p. 587 by Ew. Flügel (right). , and also in Flügel's Neuenglisches Lesebuch (Halle, 1895), p. 151. With tro / ro / ro / ro : tro / ro / ro / ro. Flügel prints this together with several other Forester carols. On pages 123-124, he also prints the Boar's Head Carols from Hill and de Worde. This volume contains a remarkable collection of English carols; those devoted to Weilhachtslieder (Winter Night Songs) are found on pp. 121-150. The full title of the volume is Neuenglisches Lesebuch. Zur Einführung In Das Studium Der Denkmäler Selbst Nach Den Handschriften Und Ältesten Drucken Herausgegeben Von Ewald Flügel (Halle: Max Niemeyer, 1895). A PDF of the scanned volume is available at Google Books, Neuenglisches Lesebuch-Google, and at the Internet Archive, Neuenglisches Lesebuch-IA.